Like many children’s museums, the Peoria PlayHouse Children’s Museum has a “maker” exhibit, where children can use tools (hammers, saws, drills, glue guns, etc) to make things. As I watch the Peoria PlayHouse Children’s Museum educators develop prompts and activities for this area, I wonder if we are re-inventing the wheel. So many museums are doing this exact same thing: designing open-ended activities that engage children and families in the act of making. Because of this, I am wondering, What is the best open-ended, maker-based activity you have conducted with children and/or families? Three different visitor solutions to the prompt, “Make something that makes a sound,” in the PlayHouse Real Tools maker area. I am not a proponent of asking educators to take and teach someone else’s lesson plan, without reflection or transformation. Indeed, I think one of the great problems with 21st century K-12 education is that teachers are often asked to do exactly that. The passion of the educator is key to the success of any lesson. On a recent visit to the Children’s Museum of Pittsburgh I asked a MakeShop teaching artist which MakeShop activities he thinks are strongest. He answered, wisely, that the strongest lessons are those that excite the staff teaching them, and that these lessons, and this excitement, is personal and varied. Similarly, when I worked with teaching artists at the Guggenheim, one of our core tenets was that each year’s project was planned in collaboration between teaching artist and partner teachers. We never would have asked a teaching artist to implement someone else’s lesson plan. 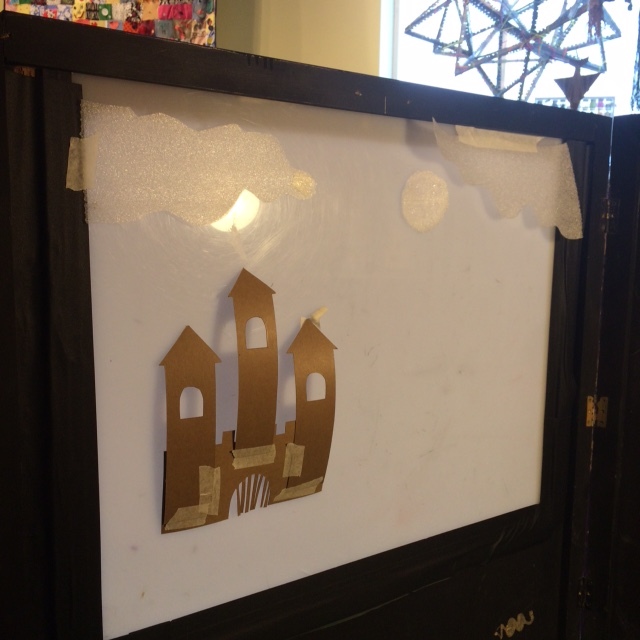 Back of the shadow puppet theater in the MakeShop at the Children’s Museum of Pittsburgh. Instead, the purpose of collecting and sharing lessons is to create a starting place. An inspiration bank. Educators in large museums – at least, in large museums that care about and excel in museum education – have vibrant communities of people with similar jobs and concerns to inspire them. How can museums collectively use existing lesson ideas in this same way – not copying them, but hearing, adapting, refining, and resharing them? How can we as a field create go-to spaces for this type of sharing? Some of this sharing of lessons exists already. The Exploratorium has a blog which shares fantastic projects. The Children’s Museum of the Arts publishes a “catalog” each year with information on their exhibits and instructions for related art projects (If this is available online, I cannot find it). I am sure other museums share lessons – these online resources are one of the things I hope to uncover and share. With this in mind, I am asking: What is the best open-ended, maker-based activity you have conducted or experienced for children and/or families, in a drop-in environment? Please share your ideas using this survey. Please share this survey with colleagues who might also have ideas to share. I will share all these ideas with readers in another post. Ideally, I’d love to collect video that could be used as a staff training tool, as well – but one step at a time. ← How can museums contribute to dialogue about social justice when we are exemplars of segregation? I’d be curious to know how effective these spaces in general. I’ve seen maker spaces empty. And I suspect this is because sometimes there is not enough scaffolding for some kids. Ex: What do I do with all this stuff? Designing of the activities could be a crucial ingredient for success. Has anyone done a study on whether these spaces are being utilized as much as other parts of a museum. Are they a trend or are they around to stay? Good question. I think maker spaces attract older audiences than children’s museums typically do. For us at the PlayHouse, this means that during the school year, on weekdays, our “Real Tools” area is often underutilized. Good scaffolding requires significant staff attention. We do offer this, but it means that we can only get one kid started on a project at a time, unless they are there with a parent who can help them. I agree that activity design is key, but scaffolding still needs to be offered by a trained facilitator. Maker Spaces seem to me to be part of a larger movement to engage visitors as producers rather than merely consumers. I don’t think they are here to stay forever, but I think this movement will continue to grow for a while.